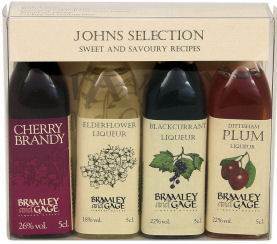 This Johns Selection Gift Pack includes 4 x 5cl miniatures presented nicely in a Selection Box. Each in a box set with recipes and drink ideas. Made in the traditional style, like sloe gin but using only sour cherries, French brandy and a moderate amount of sugar. Delicious straight, in cocktails or mixed with mineral water. Cherry Brandy is a great accompaniment to fruitcake. With an intense floral aroma and balanced sweetness, this liqueur makes an ideal aperitif or digestif. The taste lingers on the palette with a fruity taste of hints of citrus and lychee. Starts with a bold fresh plum sweetness followed by some acidity and hints of prune. Mild almond tones follow with an alcohol lift. The liqueur has an earthy incense like perfume and taste, and brings to mind summer days picking them. The flavour has a kick to it and will add interest and zing to dishes both sweet and savoury.